Explore one of the oldest souks in the Arab world, with a network of winding alleyways where the traditional and modern sit side by side. Stepping back in time into this busy market place, you could discover just a few of the treasures on offer or relax in coffee shops and cafes. You may want to try your hand at bargaining with sellers for frankincense, Asian spices, precious gems, gold, silver, antiques, Indian and Omani artefacts and troves of others. If you’re taking a trip to Muscat, a visit to this bustling souk is a must. 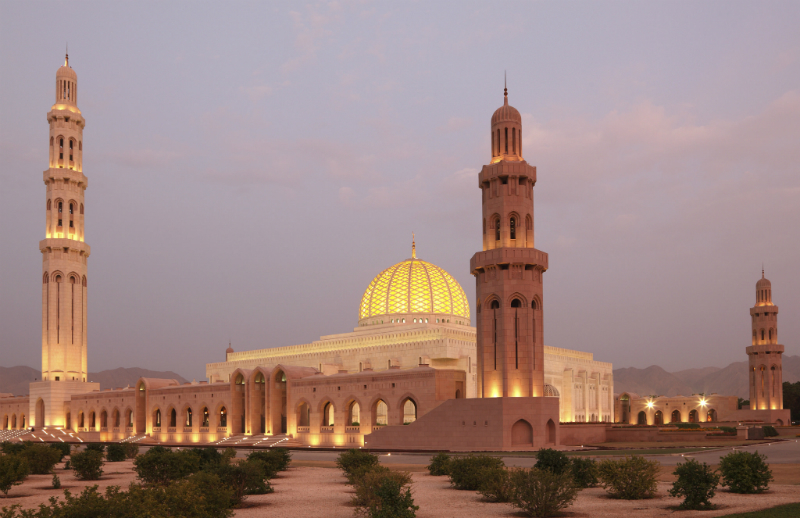 This large and impressive mosque was built as a birthday gift to the nation from Sultan Qaboos to celebrate the 30th year of his reign and opened in 2001. The interiors are rich and grand, showcasing the second largest hand loomed prayer carpet in the world; taking four years to make and measuring at 70 metres x 60 metres, the Iranian carpet was made by over 600 women. The mosque has a capacity of 20,000 and a private women’s prayer hall for up to 750. A grand and breathtaking example of modern Islamic architecture. An exterior shimmering with turquoise and gold is the Sultan’s Palace, built in 1972 on the site of the former British embassy, is used for official visits and receiving distinguished visitors. The long, curving Mutrah corniche runs alongside the main port harbour, where fisherman deliver their catch to the fish market daily. Mosques, monuments, forts and towering mountains make this a distinctive sight to enjoy, especially in the evenings when the forts and monuments are floodlit, and lights of hotels and mosques shine across the harbour. Here, you may want to take an evening stroll that leads to the Sultan’s palace whilst taking in the delightful sights along the way. Constructed in 2001 the Royal Opera house was designed by the same architects as the Grand Mosque. The exterior is made from serene marble and the interiors are magnificently decorated with Arabesque designs. If you are a lover of the arts, you could catch a world class performance of ballet or opera, but don’t forget to observe the strict dress code that sees audiences stepping out in their finest. A small and quiet town surrounded by the restored city wall and situated in a small bay at the eastern end of Muscat is the home of the ruling sultan. The town retains its old world charm with a much different atmosphere to that of the main part of the city. Some of the strange local laws here have included a ban on playing music in public, no smoking in the main streets and, until the mid-twentieth century, closing the city gates for three hours after dusk; an intriguing piece of Muscat’s past to explore. Travel allows for some unique opportunities and a holiday in Muscat offers the chance to experience one of nature’s wonders; sea turtles nesting. An excursion to Ras Al Hadd will usually allow you to take in striking sights in the day, including the clear, blue waters of Wadi Bani Khalid, the fishing town of Sur, Bibi Miriam’s tomb and others. However, in the evening here, turtles nest on the beach and run back to the sea. You could be a part of this amazing phenomenon, witnessing nature’s majestic creatures up close. A moving experience for nature lovers. Experience the desert’s red and white sand dunes that can reach up to 200 metres and stretch towards the distant horizon making a spectacular sight. Some excursions will include a drive on a 4×4 dune buggy to catch a glimpse of Bedouins moving through the desert on camels. See a traditional Bedouin home before making camp for the night whilst witnessing a desert sunset as day turns to night and the stars come out; a memorable experience that’s hard to pass up. A trip to Muscat is exotic and timeless, offering a variety of unique opportunities not to be had at home. Travelling outside Muscat will lead you to even more wonderful sights to discover; the city is yours to explore. From camping in the desert to watching sea turtles, a holiday in Muscat is truly unforgettable.